CCD’s Incident Analyst product was designed from the ground up to provide a cost effective tool that quickly identifies potential issues before they become major problems. When an incident does take place, AEMS provides an accurate record of events to help minimize costs and prevent future occurrences. The browser-based interface minimizes the need for user training. Context sensitive help and field-level hints are provided to guide the users through the reporting process. 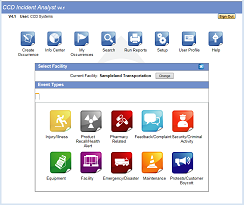 Incident Analyst allows safety professionals total control of the incident reporting process including what is collected, when it is collected, the workflow and extent of notification based on type of incident, severity and confidentiality. The built-in Workflow Manager is designed to support your organization’s policies. During implementation, your business rules are incorporated into our automated Workflow Manager. As an event moves through the process, criteria entered into the Workflow Manager are used to determine which questions to ask and who should be notified. Supports the creation of an unlimited number of question lists. Each list is then used by the system to collect user input and ensure proper incident reporting. 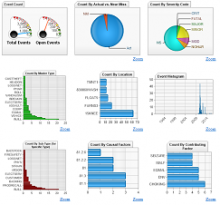 Allows you to set any number of review phases and assign them to each type of incident. Both collaborative and independent reviews are supported. Email notification can be configured to alert key personnel when incidents enter each phase. The application includes a flexible notification service that sends out timely email messages when incidents occur. Automated reminders are also used to keep the review process on schedule. Receive alerts on your PDA, page, cell phone or by e-mail. Access an assortment of standard reports to view trends, breakdown department stats or check on corrective actions to measure your quality improvement progress. Contact us for an online demonstration or download the brochure here.